69-year-old has raised 14 foster kids, but she’s not done yet..
What does a mother and grandmother do when she reaches retirement age? Bake cookies? Crochet? Dote on her husband? Travel? Ginette White, 69, does these things, but the activity that keeps her busiest is quite atypical – she takes in foster children. Mrs. White and her husband Dale, Grove City, have been foster parents since 1967, when their oldest son volunteered to fight in Vietnam. They took in the first child, a little boy, to help get her mind off of the one who was headed for combat, explained Mrs. White. Mrs. White’s son survived the war, but later was killed when he was struck by a drunken driver. Mrs. White met her husband at a post office in Paris during World War II, when he was stationed in France with the American Navy. She came to the United States after the war, in 1946. Wedding plans were postponed three times because of Dale White’s military obligations, and the young French woman had to have her visa extended. They were married in April, 1947, and their first baby was born 14 months later. Mrs. White had seen children starving in France, and she knew there were kids in America with the same problem. Mrs. White said her reward as a foster mother is knowing that she’s giving the children something they need. A second reward is the love the children return to the Whites. 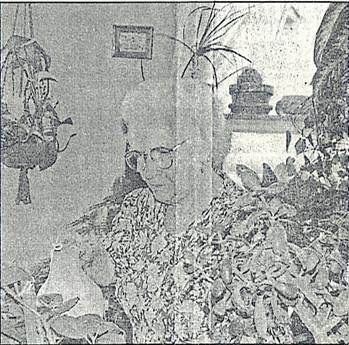 Mrs. White, smiling broadly, related a story about one foster daughter, Rose Faust, former Rose Frazier, whom she and her husband tried to adopt several times. Red tape prevented the adoption from going through, but Mrs. White said that in their hearts, Faust is their daughter. Last month, on Grandparents’ Day, Faust, now married with her own child, organized a family dinner to surprise the Whites. “She liked to have little surprises for us,” Mrs. White said. Over the years, the Whites have cared for 14 foster children. Two were adopted by other families, and one was returned to his own family. The others the Whites took in when they were very young and raised to adulthood. Mrs. White said it wasn’t difficult mixing the Whites natural family with the foster family. Will the Whites stop taking in foster children to relax during the golden years? It doesn’t look that way. They’re now caring for a toddler who keeps them on their toes. Mrs. White said she’s never been able to join clubs or organizations, because she hasn’t had time. She became a United States’ citizen in 1956.